Twenty layers of different colored tissue paper are die cut into five different shaped targets. The colored tissue paper targets are removed from the package and placed in the toilet bowl. 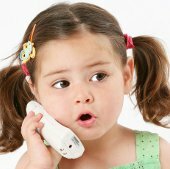 The number of targets used at a time depends on the age and abilities of the youngster. 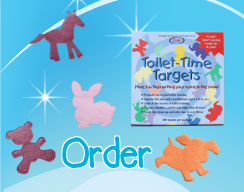 During the toilet training phase we recommend using three to six targets, however, as the child's aiming abilities increase more targets can be used to maintain the child's interest. More targets can be used to increase the likelihood of hitting the target or when toilet training a girl. 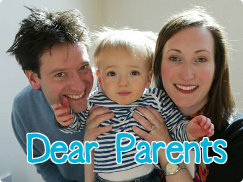 The target attracts the attention of the child, helping him focus on urinating into the toilet bowl. The package can be placed on a shelf or hung with it's built in hanging device. The compact design was chosen so that consumers would leave the package on top of the toilet tank, helping to stimulate usage. Cynthia can relate to Nicole & Sofia when it comes to potty training her model daughter Lily Rose. "I often have to change Lily Rose's diapers when we're on auditions," she says, adding that most of the time her 2-year-old lets her know when she has to tinkle but won't actually use to the potty. 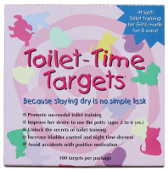 So Lily Rose is trying the Toilet-Time Targets, which claim to help improve the desire to use the potty.